Geological Map of Essex County, Mass. 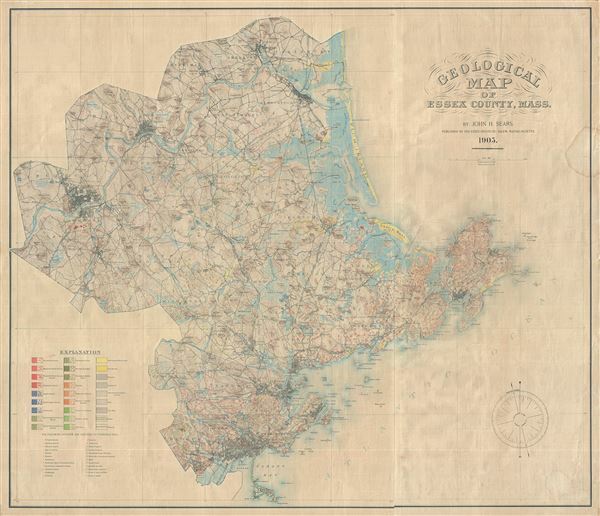 This is a beautiful large geological map of Essex County, Massachusetts. It covers Essex County in its entirety and shows the distribution of the different types of rocks or geological formations of the region. The area represented extends north from Nahant and Lynn Harbor to Amesbury and from Methuen east to Rockport inclusive of important ports and destinations like Nahant, Lynn, Beverly, Salem, Gloucester, Cape Ann, Rockport, Plum Island, Ipswich and Newburyport. The map notes several towns, cities, railroads, rivers, roads, lakes, swamps, islands, bays and a host of additional topographical and geological features with a legend included in the lower left quadrant. This map was created by John Henry Sears, Curator of Geology, Mineralogy, and Botany at the Peabody Museum and published by the Essex Institute, Salem, Massachusetts. Very good. Overall toning and edge wear. Backed on linen. Minor foxing, especially near right margin.